Have you struggled to lose weight and keep it off? Many people think that it can be too expensive to eat healthy. But it’s actually not that expensive and is a lot less costly in the long run, since you will help prevent many health problems. 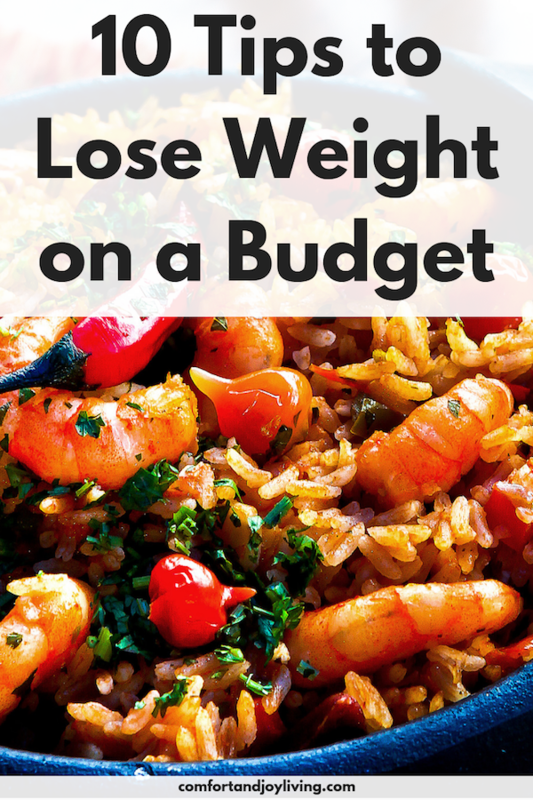 If you want to lose weight on a budget, here are some tips that can help you. 1. Eat at home and plan your meals. Meal planning takes the guess work out. You’ll shop for what and how much you’ll need and nothing will go to waste. And you’ll be less likely to get take-out on the way home from work. 2. Increase your intake of whole grains and legumes. Beans are a great source of protein and are a good replacement for red meat. Whole grains and legumes are not only healthy and filling, but they can easily be incorporated into your meals. They’re great side dishes and can also be added to soups, salads and casseroles. And they can easily be bought in bulk, which adds to your savings. 3. Eat less red meat. We’ve cut red meat way back in my household and we’ve seen the both the health and financial benefits, since it’s so expensive and even my husband agrees! Since my husband loves burgers, I started buying meatless veggie burgers and even make my own with a variety of beans like black beans and garbanzo beans, whole grains, veggies and spices. There are tons of recipes online and you can experiment with your own ideas. 4. Shop the perimeter of the grocery store. By shopping around the perimeter of the grocery store, you’ll avoid the expensive convenience foods that are usually stocked front and center. The middle aisles contain processed and packaged foods that are usually higher in sodium and sugar and are more expensive due to the costs associated with packaging. That leaves you with the fresh produce and frozen foods sections, which offer great low-costs and healthy alternatives. 5. Buy healthy foods in bulk. Buying in bulk can be a great way to budget for long-term savings and weight loss. For example, try buying a whole chicken and cook a portion of it one night with steamed vegetables. Then, serve leftover chicken on top of a salad with a light dressing the next day for a quick and healthy meal. At the grocery store, buy large bags of rice and frozen vegetables versus individual containers. Try getting a large container of oatmeal rather than the sugar-laden individual packs. Instead of buying overpriced pre-packaged individual servings, get the full size of your favorite smart snacks when they’re on sale. Then create your own mini snack packs using the correct portions for weight loss. Free accountability is a great way to create your own motivational group. Find friends, family or people on social media who would be willing to help you through your weight loss journey. This can really help you move in a positive direction when it comes to losing weight and also saving money while doing so. 8. Get creative with exercise options. You don’t need to spend a lot of money on a monthly gym fee to get moving. Instead, find fun activities that you can enjoy for free. If you’re just getting started with an exercise routine, try beginning with daily walks: start slow and build up distance and speed. Other no-cost ideas include jogging, dancing and simple strength training like pushups. Or look for free workout videos online and DVDs at the library. 9. Cut your meal in half for the next day. When you cook dinner, talk half of your food and place it in a container for your lunch at work for the following day. By doing this, you’re instantly cutting your food intake AND covering your lunch for the next day. By taking your lunch instead of ordering take-out, you’re not only controlling what you eat—but also helping your wallet. If you want to eat healthy, then you need to cut out soda, processed juices and canned drinks. Besides being unhealthy, they increase your food bill. Fruit juices tend to raise the level of insulin and don’t offer much nutrition. So instead of having these drinks, try relying on water to quench your thirst. Water is cheaper and healthier and is required by your body for hydration to carry out functions efficiently. You can also choose to drink herbal teas and homemade almond milk to get a good dose of vitamins.